As a whole, the nation has seen a major rise in the recreational use of the synthetic drug, Fentanyl. In many cases, Fentanyl is used as a heroin substitute. Its euphoric effects are much like heroin and morphine, which has been a major motivation for its use. Fentanyl is 30-50 times more potent than heroin and 100 times more powerful than morphine. 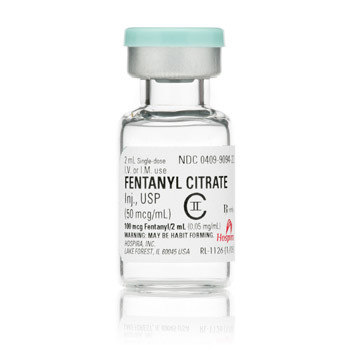 In high and unregulated doses, this pain reliever can be very dangerous; in fact, Fentanyl is the strongest pain reliever (Opioid) used in the medical field. For this reason, it should not be used recreationally, even in doses as small as .25 mg it can cause major health effects. Fentanyl use is occurring in several way, all of which are very dangerous. Fentanyl can be used in the same way as heroin- through injection with a needle, inhalation, or a pain reliever patch. The full effect of the patch occurs within 12-24 hours after being in contact with the skin. It is very dangerous to even be in the area of Fentanyl use, especially if it is being ingested in powdered form. Individuals that accidentally inhale Fentanyl can still experience its negative effects. Even if you are not directly participating in using Fentanyl, be sure to stay out of settings in which Fentanyl use is occurring. Fentanyl is extremely dangerous on its own, but is even more potent when mixed with the use of other illicit drugs or alcohol. If you see someone experiencing the following symptoms after using Fentanyl, call for help immediately.